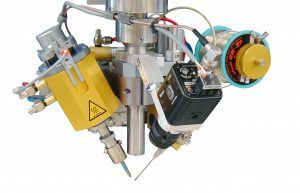 The 80 or 150 Watt soldering iron is the most common technique used in robotic soldering. A DC motor drives the wire feed to ensure a precise and consistent solder feed. The solder tip is designed to be changed quickly and easily with very good repeatability of tip position. Typical soldering bit life span 20,000 to 60,000 points. Angle of the soldering iron tip and the solder feed tube can be adjusted to suit the process. Fume extraction is located at the point of soldering. The soldering head is tried and tested with lead free solder. Most widely used soldering technique. Precision of wire in feed +/- 2.5%. Wide temperature range 300 0C – 450 0C.